" Paul Ducharme Prop. " To see the dairy (photo August 2008) click on the picture! 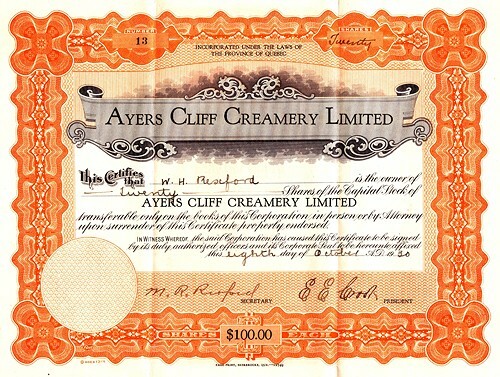 The Ayer's Cliff Creamery was owned by two brothers Marshall Rupert Rexford (1880-1956) and Willard Harold Rexford (1891-1968) both of Ayer's Cliff, P.Q. Marshall worked for many years as the district superintendant for " H.P. 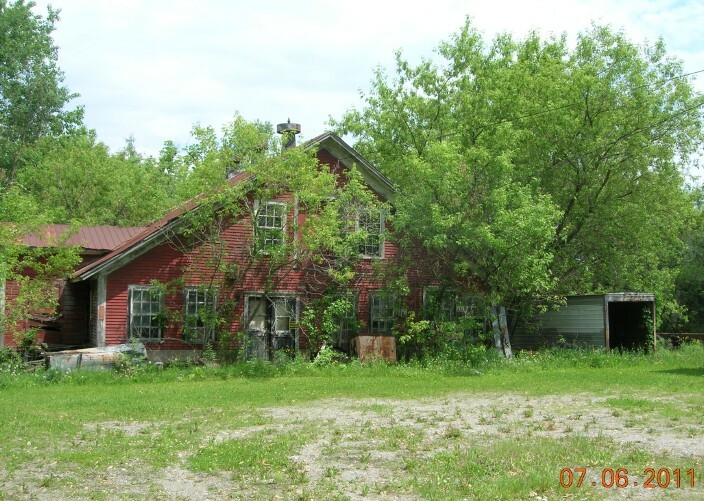 Hood and Sons " in North Hatley, Johnville, and Ayer's Cliff Willard graduated from the " École de Laiterie de St-Hyacinthe " in 1926 with his diploma as a butter maker. 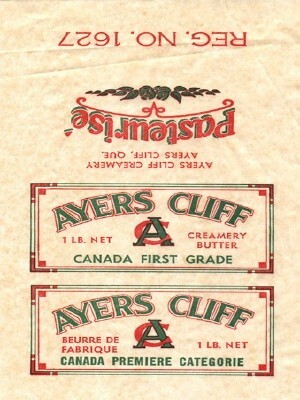 They formed the Ayer's Cliff Creamery in 1930, and produced high quality prize winning butter until their retirement in 1950, at which time it was sold to Mr Alfred Longpré and Mr Léon Frappier. 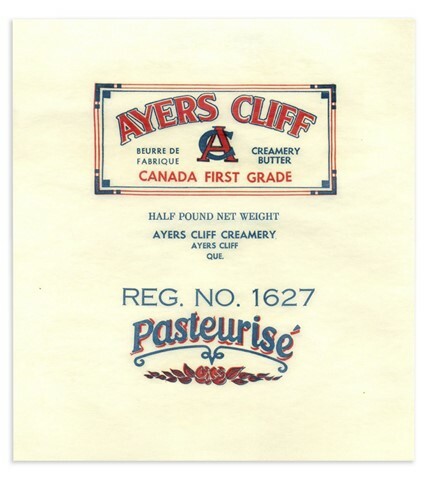 Mr Longpré had run a creamery several years earlier in Way's Mills P.Q. 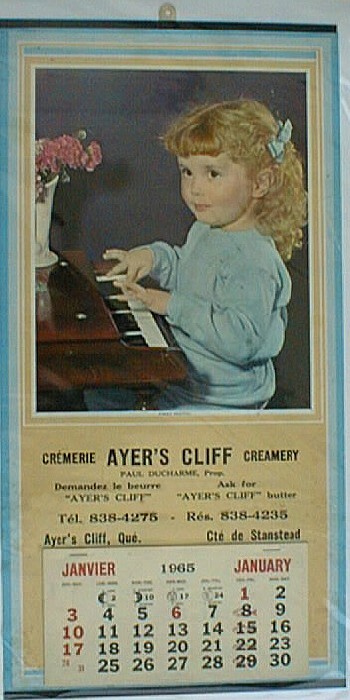 I believe the creamery was sold to Mr Paul Ducharme, however I am not sure when he bought it, or how long he operated it. 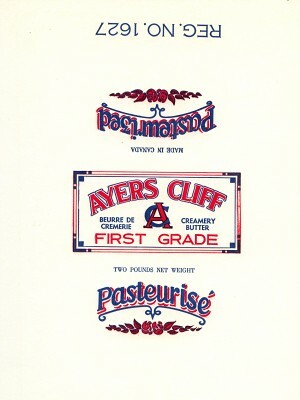 I include a picture of the creamery and a copy of a stock certificate owned by my grandfather W.H. Rexford. My grandfather "Willard Rexford" was one of the previous owners of this creamery.